The Muppets! My household is in love with, and maybe a bit obsessed with The Muppets! We weren't able to go and see the movie in the theater since a family of 5 would have cost a small fortune, so we bought it on Blu-Ray last week when it was released. Somehow my kids were unfamiliar with the Muppets. I LOVE Jim Henson, and my kids know The Fraggles (my personal favorite), The Dark Crystal, The Labyrinth, but the Muppets somehow got left out. The Muppet movie reminded the Mr and I of everything we loved as kids about The Muppet Show. The movie kept with the spirit and humor of the original Muppets, and it was like seeing long lost friends. 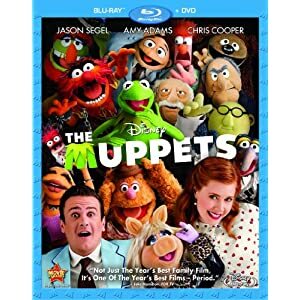 The Muppets was funny from beginning to end, and the songs were stuck in all of our heads, so the next reasonable thing to do was download the soundtrack! We have listened to it over, and over. We even bust out in to song out of nowhere! We are completely in love with The Muppets, and I'm so excited that my kids now have a love for the Muppets too!